America could elect its first woman president next year, but even that would be a hollow sign of progress in a country mired in gender inequity. The Supreme Court may well gut Roe v. Wade. Access to abortion and contraception has regressed dramatically, and clinics face increasing intimidation. The pay gap is stubbornly broad. Campuses struggle with disturbingly high rates of sexual assault, and domestic violence is all too common. America seems a long way from becoming a society in which young men and women have equal opportunities to succeed. And yet data suggest that many Americans—disproportionately men—believe America already is such a society. To analyze attitudes about gender, I turned to the 2012 American National Election Studies survey, frequently used by academics to explore public opinion. It has an impressive sample of young people—1,392 respondents between the ages of 17 and 34, including 647 and 745 women—and a battery of questions that relate to gender equity. Three in particular were revealing. The first was about traditional gender norms: Do you think it is better, worse, or makes no difference for the family as a whole if the man works outside the home and the woman takes care of the home and family? Young men and women had roughly the same attitudes about that—if antiquated ones. About a third of each said it was better for the woman to stay home. The next two questions were more direct. And the answers suggest that men are blind to continuing structural inequities and perceptions about women in society that restrict success and opportunity. The survey asked whether men or women have more opportunity for achievement. Almost half of young men—47%—say opportunities are equal, while only 37% of women think so. Meanwhile, 62% of women say men have a better shot at achievement. Only 47% of men agree. The gap is even wider on whether men have “many more” opportunities. Another blunt question asked by the survey: How serious a problem is discrimination against women in the United States? Young men are more likely to say that it’s not a problem at all: 11% of men think that, compared with just 5% of women. And men are more likely than women to say that it’s just a minor problem. The gaps are far smaller for Democrats than Republicans. Interestingly, when I examined only young people with college educations, the gaps are even larger than they are in the full sample. College men may see successful women on campus and perceive that women have more opportunities, while college-educated women appear more attuned to persistent discrimination. Barnett cites frequent slights about women’s appearance at official meetings and the dearth of women in high positions of student politics. Other, more recent sources also support these findings. A Pew poll from 2014 finds that young men are less likely than their fathers to say that it’s easier for men to reach the highest echelons of business and politics, but that there are more than 10-point gaps between young men and women. These gaps remain among Democratic men and women. By almost 20-point gaps, women are more likely to say that women in political positions (47% and 28%) and high-level business positions (52% and 33%) are held to higher standards than men. I also examined how young men compared with older men, and found that young men are far less likely to say that it’s better for a woman to stay home (65% of men over 65, compared with 36% of men 17 to 34). But young men were also far more likely to say that men and women have equal opportunities (39% of men over 65, compared with 48% of young men). The numbers are stubbornly sticky. And there isn’t much reason for optimism: Young men are slightly more likely to endorse the view that abortion should be banned altogether — 14% of young men say so, compared with 8% of men over 65. As I’ve written, a large literature from both political science and psychology suggests that the election of Barack Obama led many Americans to accept the narrative of a post-racial society and ignore the continued presence of institutional racism and structural disparities. These results suggest that the nomination and possible election of Hillary Clinton, combined with the already increasing presence of women at the highest echelons of society, may lead men (and some prominent women) to believe that there are no longer structural barriers to full equality. It already appears to be happening. Young men are far less likely to endorse the explicitly sexist view that women should remain in the house with children. But young men are also far more likely than their fathers to say that men and women have equal opportunities in society. Young men may already see a post-gender society that simply doesn’t exist. NOTE: These questions sometimes include a range of possible answers—in some of the charts I have condensed the answers in order to better visualize the data. This piece originally appeared on Fusion. This entry was posted in Uncategorized on March 13, 2016 by seanadrianmc@gmail.com. This piece was co-written with Jesse Rhodes. This piece originally appeared on Slate. This entry was posted in Uncategorized on March 12, 2016 by seanadrianmc@gmail.com. The 2016 election will be decided not just by who votes but by who stays home. Voters were for a long time assumed to be a carbon copy of the electorate, but new research suggests turnout is tilted toward conservatives. The key to implementing progressive policy is therefore boosting voter turnout by reducing barriers to registration and mobilizing low- and moderate-income voters. The most important fact about the above chart is that it shows Democrats are missing a huge opportunity by failing to register more low-income voters. While the richest nonregistered Americans prefer Democrats by a margin of 4 percentage points, the poorest nonregistered Americans prefer Democrats by a whopping 24 points. And the middle class (individuals with an average yearly income of $30,000 to $74,999) prefer Democrats by 16 points. In other words, the group that is least likely to be registered (low-income people) is most likely to support Democrats. According to 2012 census data (the most recent available), 65 percent of those earning less than $30,000 say they are registered, 26 percent say they are not registered, and 9 percent did not give a response. To examine how boosting voting might affect policy on inequality, I asked Pew about its inequality survey. These data also show that the nonregistered population is more liberal than the registered population. Pew asked people which would do more to reduce poverty: “Raising taxes on wealthy people and corporations in order to expand programs for the poor” or “Lowering taxes on wealthy people and corporations in order to encourage more investment and economic growth.” While majorities of both registered and nonregistered Americans say that raising taxes on the wealthy would do more to reduce poverty, nonregistered respondents were more supportive than registered ones (59 percent and 51 percent, respectively). In addition, while 69 percent of registered respondents supported raising the minimum wage, 82 percent of nonregistered Americans did. While 60 percent of registered respondents supported a one-year extension of unemployment benefits, 69 percent of those who are not registered did. These findings conform to other research suggesting nonregistered Americans favor a far stronger economic role for government. Simply knowing that the rich and poor have differing views isn’t enough to prove that mobilizing the poor would change policy. However, recent research suggests it would: In his Ph.D. thesis, which is under review (other parts of the dissertation have been published), political scientist William Franko examines how class bias in participation affects how often legislators introduce and act on bills related to the interests of the poor. Class bias is the difference in the probability that a rich person votes compared with a poor person. In Kentucky, for example, a state with a relatively high class bias, a rich person is 39 percent more likely to vote than a poor person. In New Hampshire, a state with a relatively low class bias, the difference is 25 percent. Franko finds that if states with the lowest class bias — New Hampshire, for instance — had the same high class bias as, say, Kentucky, the change would lead to a decrease of 17 percent in support for the introduction of bills related to welfare and 22 percent in bills related to housing. The opposite is also true: Decreasing the class bias of the electorate would lead to more bills related to these issues. In a recent paper, Franko finds that lower class bias leads to more spending on health care for children, higher minimum wages and more anti-predatory-lending policies. Parties can change the composition of the electorate, but they have failed entirely to bolster voting among the poor. According to ANES data, only 37 percent of those earning less than $30,000 reported receiving contact from either party regarding the 2012 elections, compared to 47 percent of those earning more than $100,000. And this sort of outreach makes a difference. Using the ANES data set, I examined Americans earning less than $60,000 who did not vote in 2008. I found that 41.5 percent of those who were contacted by a party voted in 2012, compared with only 28.1 percent of those who were not contacted by a party. When I removed the control for those who did not vote in 2008, the effect became much stronger, with 85 percent of those earning less than $60,000 who were contacted by a political party voting in 2012, compared with only 64 percent of those who were not contacted by a party. Conservatives have taken steps to prevent reform, often fearing for the electoral future of the Republican Party. In 1977, Ronald Reagan worried that Jimmy Carter’s push for universal registration would make the GOP “dead as a the dodo bird.” Today studies suggest that an increase in turnout among low-income people and people of color leads to the introduction of voter ID laws, which suppress voting. Conservatives have staunchly opposed policies to make voting easier, frequently rolling back early voting or opposing same-day registration. The divide is clear, and across the country, conservatives are trying to prevent low-income people and people of color from voting. After a Republican governor took office in North Carolina, a strange thing happened: Voter registrations at the local DMV remained virtually unchanged, but voter registrations at the local public assistance office plummeted. America is slouching toward plutocracy, and democracy is the only cure. But that won’t happen magically overnight; national research establishes definitively that governmental responses to inequality will be determined by who votes. In the 2010 midterm elections, only 16 percent of young people earning less than $30,000 voted, while 74 percent of seniors earning more than $150,000 did. Without major changes, that spells doom for democracy and economic equality. This entry was posted in Uncategorized on March 11, 2016 by seanadrianmc@gmail.com. In the wake of the June 17 mass shooting by Dylann Storm Roof in Charleston’s Emanuel AME Church, the nation has debated the pervasive influence of racism throughout American society. In addition, many politicians and commentators have called attention to the Confederate flag, a symbol of white supremacy, and demanded that it be removed. Governor Nikki Haley recently called for the flag to be removed from the state capitol. While such a step would be significant, it would not erase the underlying reality: Non-Hispanic whites living in formerly Confederate states still hold racist views at a higher rate than the rest of the nation. In a 2013 study, legal scholars Christopher Elmendorf and Douglas Spencer developed a measure to examine racial stereotyping across states by using responses to large surveys that asked respondents to rate how hard-working or intelligent black people are. They find that South Carolina ranked third highest in terms of non-black people expressing anti-black stereotyping and fourth in terms of white people expressing such sentiments. Indeed, using their metric of anti-black stereotyping, five formerly Confederate states (South Carolina, Mississippi, Alabama, Georgia, and Louisiana) rank in the top 10 states for racist whites, while Florida and Texas are in the top 15. These results are supported by other studies in other countries. For instance, research suggests that the slave trade still affects levels of trust in African countries that were heavily targeted by slave traders. There are similar findings for anti-Semitism: Towns and cities with a higher rate of pogroms during the Black death had higher Nazi vote shares in the 1928 election, higher deportation rates of Jews after 1933 and more synagogues destroyed during Kristallnacht. The first and second questions, which measure racial resentment, were used by Acharya et al. The second area concerns racial stereotyping. The associated questions ask respondents to say whether they believe that black people are “hard-working” or “lazy,” “intelligent” or “unintelligent” and whether they have “too much influence” or “too little influence” in politics. And finally, I also look at attitudes towards solutions, such as whether respondents support government aid to blacks or think that the government should ensure fair jobs for blacks. My analysis focuses only on non-Hispanic whites in Confederate and non-Confederate states. On structural issues, I find large and consistent differences between whites living in formerly Confederate and non-Confederate states, with the largest gap being a 15.4 point difference in whether blacks could be just as well off as whites if they tried harder. Across all structural issues, there is a 10.5 point difference on structural racial issues. Finally, whites in the former Confederacy are strongly opposed to government action to remedy racial inequality. This likely stems from whites rejecting structural narratives for racial inequality, and while it is exacerbated in the former Confederacy is pervasive across the nation. The former Confederacy’s race problem shows no sign of going away. As I’ve noted before, age doesn’t influence racial attitudes. Nearly 40 percent of whites under 34 years old living in formerly Confederate states say that blacks are lazy — a statistic indistinguishable from those over 65. In addition, 30 percent of young whites in former Confederate states say black people are “unintelligent,” a statistically indistinguishable 3 points lower than those over 65. In addition, while 26 percent of old whites say that black people have too much influence over politics, 30 percent of young whites do. These data points suggest that southern states need to do far more than take down their Confederate flags. And while whites that are not in the former Confederacy are less likely to endorse racial stereotypes, they are by no means free of racist attitudes. America needs to begin rooting out racism, or else it will poison our democracy for centuries. But this much is clear: Racism will not simply fade away — it must be eliminated. This entry was posted in Uncategorized on March 10, 2016 by seanadrianmc@gmail.com. Jacobs and Druckman’s research is especially important to growing concerns about inequality. In a 2006 study in the Oxford Review of Economic Policy journal, political scientists Thomas Cusack, Torben Iversen and Philipp Rehmfound that those in the highest income quartile are 18 points more likely to “strongly disagree” with government redistribution. 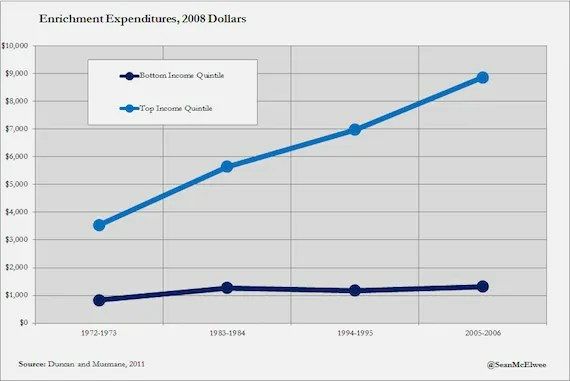 As illustrated in the chart below, using data from the American National Election Studies, I find a similar result: While those earning less than $25,000 are in favor of redistribution, those earning more than $150,000 are strongly opposed, with 62.6 percent saying government should not redistribute. The more influence high earners have on policy, the less likely inequality will be addressed through redistributive policies. Why do the rich have so much more influence? Donors to political campaigns, who tend to be rich, have stronger influence over policy. Granted, there is strong overlap in preferences between donors and nondonors in the same party. To test whether the donors had more influence, political scientists Michael Jay Barber, Brandice Canes-Wrone and Sharece Tower zeroed in on issues where co-partisan donors and nondonors disagreed. They found(PDF) that donors exert more influence on presidential positions, while nondonors, even those of the same party, have no significant effect. Barber found a similar effect in the Senate. This entry was posted in Uncategorized on March 8, 2016 by seanadrianmc@gmail.com. The Affordable Care Act is probably the most progressive policy Americans born after the Great Society will witness in their lifetimes. It has saved tens of thousands of Americans from premature death and has already insured more than 12 million people. It has already defined Barack Obama’s legacy and will inevitably be at the center of the 2016 election. So why do so many on the left despise it? The ACA critics are right that a public option or a single payer “Medicare for all” program would make our health care system less wasteful and more equitable. But as political scientist Scott Lemieux has repeatedly demonstrated, Obama passed the most liberal bill he could have in the small window when Democrats controlled both chambers of Congress. Claims that the disappointing bill resulted from a failure of nerve or ambition represent little more than wishful thinking. To understand why the ACA was the best we could get, it’s important to note some distinctive features of the American political system. First, the American system is majoritarian (the party with the most votes in a constituency wins all the seats) rather than proportional (seats are assigned in proportion of the total vote). In arecent paper, political scientists Torben Iversen and David Soskice show that majoritarian systems are more inclined toward center-right parties because the middle class have an incentive to side with the rich. As the chart below shows, majoritarian systems are more likely to have a right-wing government. Second, there is the Senate, whose very purpose was to cool political passions for reform. Because every state sends two representatives, regardless of the state’s size, it is already stacked in favor of rural interests. The fact that Republicans have begun using the filibuster has made progress even more difficult, since any legislation now requires a 60-vote supermajority rather than a simple majority. In a recent study, five prominent political scientists argued that the status quo bias in the Senate has prevented government action on inequality, benefiting the rich. Given this dynamic, it should be unsurprising that presidents, despite popular illusions to the contrary, have little ability to twist Congress into supporting their policy, as political scientist George Edwards has persuasively shown. Third, voter turnout is a key variable to creating progressive policy, as I’ve argued repeatedly. However, the United States lags far behind other Organization for Economic Co-operation and Development countries in voter turnout. Fourth, the failure of campaign-finance reform has also blunted the success of the left, and the ACA is an example: Health care companies spent millions influencing the legislation. Numerous political scientists have noted how money in politics has prevented action on inequality from both parties. There are also important social factors to keep in mind. Racism in the United States, for example, severely constrains progressive possibilities. Scholars, most recently Ian Haney Lopez, have extensively documented how conservative politicians have exploited racism to tear down the safety net. I’ve shown that the levels of Temporary Assistance For Needy Families (TANF) benefits can be in large part predicted by racial animus. The country’s individualism also poses a challenge: Americans are far more likely to accept individualist narratives of success and failure. They are more likely to blame the poor for their poverty and therefore oppose expanding the social safety net (see chart). Given these structural and social impediments, you might wonder how anything progressive has ever happened in the United States. And indeed, our safety net is shoddy and increasingly benefits the middle class and the elite. The CBO estimates that in 1979, the bottom quintile received 50 percent of transfer payments, while in 2007, the group received only 35 percent of transfers. In 2010, the Center for Budget and Policy Priorities estimated that the poorest quintile received about 32 percent of entitlement benefits, indicating that the welfare state in the U.S. is generally aimed at the middle class, unlike the Affordable Care Act. These facts make the achievement of the ACA even more remarkable. As the chart below shows, the bill’s benefits are concentrated on the bottom fifth. The Medicaid expansion provision of the ACA is also a rare example of a government policy that directly benefits the poor, particularly poor people of color. Although progressives now look at the New Deal and the Great Society with rosy optimism, those programs systematically excluded people of color. During the first two decades of its existence, Social Security excluded agricultural and domestic workers, which disproportionately harmed people of color. The postwar GI Bill, which helped to create the American middle class, also cut blacks out almost entirely, leaving them to live in poor neighborhoods. In contrast, people of color benefited immensely from the ACA, as shown below. It’s hard to overstate the political sacrifice the ACA required. Obama spent a hefty amount of political capital on legislation benefitting Americans who don’t give money to political campaigns, don’t garner much sympathy from the media, are disliked by most Americans and rarely vote. He did this even while his inner circle, including Rahm Emanuel and Joe Biden, repeatedly warned him against it. He did it knowing that many in his own party, including high profile members such as Sen. Charles Schumer, would criticize him for not doing more for the middle class. Half of the Senators who passed it have lost their seats, and Democrats may well have lost the House because of it. The Affordable Care Act is one of the most courageous pieces of legislation in American political history. It is among a very few number of major expansions of the safety net that did not exclude people of color or ignore the fact that existing disparities needed remedy (though this fact was blunted when the Supreme Court struck down the key Medicaid expansion). As 2016 warms up and the sentimental left begins to harp on how ineffectual progressive presidents are, it’s important to remember how difficult it is to build the safety net and give credit where it is due. The eventual Democratic nominee for president must embrace the legacy of the Affordable Care Act. Indeed, though Republicans initially began referring to the health care law as “Obamacare” to tar the program, this may become a strategic misjudgment. As the law becomes more popular, its association with the Democratic Party will become an asset, not a liability. But it’s not just Democratic politicians who must embrace Obamacare. Progressives should see the ACA as a key step toward our aims of a more just society, rather than a betrayal. Obama acted as a bold, yet pragmatic, politician — not a sellout. This entry was posted in Uncategorized on March 6, 2016 by seanadrianmc@gmail.com. This essay is modified from an essay published in “What Do We Do About Inequality?” by the Wicked Problems Collaborative. The book is available for pre-order here. Inequality, President Obama has claimed, “is the defining challenge of our time.” And yet, though many of his reforms are positive, he has done far too little to actually alleviate inequality. But that’s not entirely his fault; presidents, like all other humans, are confined by their circumstances, both material and ideological. Although there are a number of factors that prevent action on inequality (including racial resentment and political information), one is ideological: our society’s commitment to the mythology of upward mobility. To see how ideology functions to halt legislative action on inequality, we should examine how a bipartisan commitment to upward mobility has obfuscated the true debate. A 2007 Treasury Department study of inequality allows us to examine mobility at the most elite level. On the horizontal axis is an individual’s position on the income spectrum in 1996. On the vertical level is where they were in 2005. To examine the myth of mobility, I focused on the chances of making it into the top 10, 5 or 1 percent. We see that these chances are abysmal. Only 0.2% of those who began in the bottom quintile made it into the top 1%. In contrast, 82.7% of those who began in the top 1% remained in the top 10% a decade later. Drake may have started from the bottom, but his experience is not representative of the American experience. Studies show that this is true of capitalist systems broadly. In a recent study, Carina Engelhardt and Andreas Wagener find that in every country studied, perceptions of mobility were higher than actual mobility. Why Does Everyone Believe in Mobility? If upward mobility is illusory, why do politicians on both the left and right accept this fantasy? The main problem was recognized by Antonio Gramsci, who writes, “All men are intellectuals, but not all men have in society the function of intellectuals.” The people who benefit from inequality tend to attribute their success to themselves, rather than to luck or factors outside their control. These people then look upon the world and seek to justify it. Their justifications, because of elite power, are amplified, while the insights of the poor are ignored. The chart below, created using data from ANES, suggests that the wealthy are far more likely to believe that America is basically meritocratic. 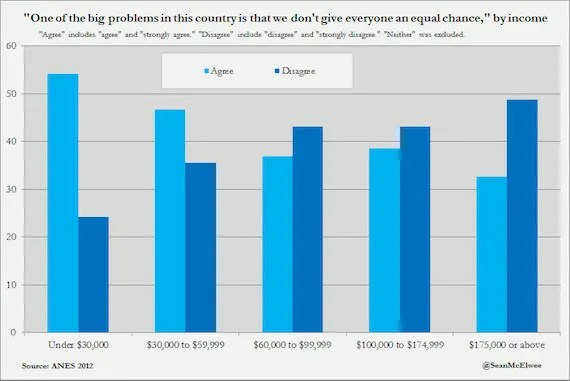 Only 33% of the richest in the survey (over $175,000 a year in family income) agree or strongly agree that “One of the big problems in this country is that we don’t give everyone an equal chance,” compared with 54% of those earning less than $30,000. Economist Branko Milanovic finds that 60% of an individual’s income is determined before they are born (and tells me in an interview it’s likely higher). Economists Larry Mishel and Josh Bivens find “the increase in the incomes and wages of the top 1 percent over the last three decades should largely be interpreted as driven by the creation and/or redistribution of economic rents, and not simply as the outcome of well-functioning competitive markets rewarding skills or productivity based on marginal differences.” Higher-paid CEOs underperform lower-paid CEOs. Hedge fund managers are vastly overpaid. In 2013, the 25 highest-paid hedge fund managers made 2.5 times more than every kindergarten teacher in the U.S. combined. Yetevery study finds that they can’t beat the market. This is, of course, risibly false. The wealthy have entrenched their advantages by investing more in their children while also supporting austerity measures that — by leaving children undernourished and undereducated — ensure the poor can rarely rise above their rank. But it’s unlikely the rich are even aware that they are justifying themselves. Psychologists have found numerous biases — the self-serving bias,optimism bias and illusions of control — that afflict us all. It is only the rich who are successful enough to become entirely delusional. What Is the Consequence of Our Commitment to the Mythology of Mobility? Our commitment to mobility prevents us from alleviating inequality. Writers, thinkers and politicians from nearly every political persuasion accept the mobility ideology in their speeches. Mike Lee warned last year of an “opportunity crisis.” Cathy McMorris Rodgers’s response to the State of the Union, which will likely define the Republican line on inequality, included the line, “The president talks a lot about income inequality. But the real gap we face today is one of opportunity inequality…” At the centrist Brookings Institution, opportunity is the watchword, with Richard Reeves’srecent essay, “Saving Horatio Algers,” which concludes, “On that spring evening in the nation’s capital, the crowd had gathered not to bury Alger, but to praise him. It is now time to pay him more than lip service. Equal opportunity must and will remain the quintessential American ideal. The challenge is to live up to it.” Kirsten Gillibrand, a liberal senator from New York, has pushed for an “American Opportunity Agenda.” Redistribution is out; mobility is in. Yet the limits of mobility as a palliative to inequality should be obvious to anyone. Even in a society with perfect mobility, someone must be at the bottom. When inequality is high, the wealthy have more of an incentive to use whatever means possible to maintain their privilege. They use their economic and political power to solidify these positions, creating a glass floor from which they can look down upon the poor, whilst exhorting them to try harder. As inequality rises, the rich are more separated from the poor, and more likely to accept their ruling ideology (the “empathy gap”). Bo Rothstein and Eric Uslaner argue that, “the best policy response to growing inequality is to enact universalistic social welfare programs. However, the social strains stemming from increased inequality make it almost impossible to enact such policies.” As inequality increases, the winner-take-all economy leads voters try to look out for their own children. The period during which overall inequality has risen has seen a massive increase in more affluent families’ spending on enrichment for their own children. Engelhardt and Wagener find that redistribution is lower when actual social mobility is but also lower where perceived mobility is higher. Even if voters perceive the level of inequality correctly, their tendency to overstate the level of mobility can undermine support for redistribution. In another study, Alberto Alesina and Eliana La Ferrara find that Americans who believe that American society offers equal opportunity (a mythology) are more likely to oppose redistribution. In another paper, Alesina, along with Edward Glaeser and Bruce Sacerdote, shows that the share of respondents in the country who think success is due to luck correlates strongly with social spending. This relationship makes sense: the safety net should be understood as social insurance, and understanding that an individual has little control over their circumstances increases support for universalistic programs. 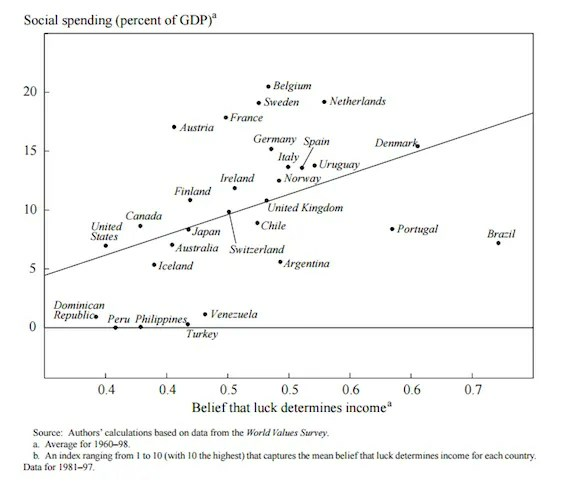 As the chart shows, the view that luck determines income is weak in the United States. The authors also show that while 60% of respondents in the European Union believe the poor are trapped in poverty, only 29% of those in the United States do. 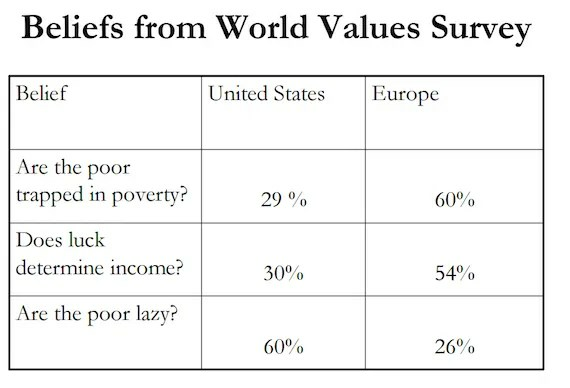 Similarly, while only 26% of respondents in the European union say the poor are lazy, 60% of American respondents do (see table). Within the U.S., 88% who say that the U.S. spends too much on welfare believe the poor are lazy, compared with 35% of those who say the U.S. spends too little on welfare. These views are obviously mediated by race, as most of those who say the poor are lazy have a certain race of poor in mind. Using data from 33 democracies, Elvire Guillaud finds that those who believe they have experienced downward mobility in the past decade are 32% more likely to support redistribution. Earlier this year, Martin Gilens and Benjamin Page rocketed to popular fame with apaper finding “average citizens’ preferences have little or no independent impact on policy.” Yet less reported was the finding that “the preferences of average citizens are positively and fairly highly correlated, across issues, with the preferences of economic elite.” This is not to say that economic elites and the general populace agree on everything — as I’ve frequently argued, they do not. But it is where they agree, on issues like social mobility, that there are dangers. Certainly no one would reject the premise “we should increase social mobility,” but the ideological baggage upon which that statement rests is an important impediment to true progress on inequality. Elite control of the political system is certainly terrifying. Money flows through the veins of the political system like never before. But the control elites exercise over opinions and perceptions is certainly the more important factor — and one even they are blithely unaware of. This entry was posted in Uncategorized on March 5, 2016 by seanadrianmc@gmail.com. This piece was co-written with Jason McDaniel. As income inequality has climbed higher and higher in America, government action has stalled. This lack of policy attention persists despite public opinion polls showing a majority of Americans favor some government action to reduce inequality. Are the wealthy to blame for the lack of action? On the one hand, there is plenty of evidence that the wealthy exert overwhelming influence over politics. At the same time, however, many middle-income and working-class people still oppose government action that could reduce inequality. The power of status quo bias and American attitudes toward individual success also contribute to the lack of government action on inequality. But that doesn’t explain the whole story. We believe there are two other key factors involved: racial animus and individual difficulty in connecting government action to lived experience. To untangle the complicated connection between racial attitudes, economic insecurity and government inaction on inequality, we turn to data from the 2012American National Election Study (ANES), a rich survey with many detailed questions on public policy, political preferences and racial attitudes. To measure racial resentment toward African-Americans, we created a scale based on five questions; for example, “Irish, Italians, Jewish and many other minorities overcame prejudice and worked their way up. Blacks should do the same without any special favors.” To measure the impact of overtly racist stereotypes, we created a scale that combines eight questions that ask whether the respondent judges Asians, blacks, Latinos and whites as either “lazy or hardworking” and “intelligent or unintelligent.” Finally, we created a scale to measure perceptions of economic insecurity using five questions that ask about economic peril. (For example: “So far as you and your family are concerned, how worried are you about your current financial situation?”) In addition to these three factors, our models controlled for race, income, education, gender, religiosity, feelings about “illegal” immigrants, age, partisanship and political ideology. The first question we examine is whether individuals favor or oppose government reducing inequality. The model results show that the two most important predictors of opposition to policy are being a Republican and having high levels of racial resentment. The lefthand panel of the graph below shows that Republicans are significantly more likely to oppose government action to reduce inequality compared to Democrats and Independents. The righthand panel shows the effect of racial resentment on support for government action to reduce inequality. The difference in attitudes toward inequality between those with low levels of racial resentment and those with high levels is almost the same as the difference between Democratic and Republican partisans. Identifying as ideologically conservative also increases opposition to inequality-reducing action, but the size of that effect is dwarfed by the effect of identifying as a Republican. Perhaps most surprisingly, factors related to income and feelings of economic peril or insecurity have no significant impact on opinions regarding whether government should take action to reduce income inequality. We find similar results when we examine attitudes toward one of the most effective policies to reduce inequality: government aid to the poor. 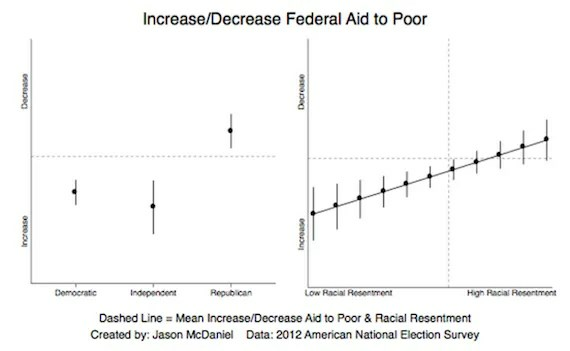 Again, those with high levels of racial resentment are significantly more likely to prefer decreased federal aid to the poor compared to those with low levels of racial resentment. Unsurprisingly, Republicans prefer that federal aid to the poor be decreased, while Democrats and Independents want it increased. It is important to note that overt racial stereotypes have no influence on attitudes toward federal aid to the poor or action to reduce inequality. In older research, Nathan Kelly and Peter Enns demonstrated that as inequality rises, support for redistribution among Americans decreases. Research by political scientist Larry Bartels as well as political scientists Jacob Hacker and Paul Pierson shows that the general public has difficulty connecting public policy with inequality. Bartels observes, regarding the inheritance tax that benefits the very wealthy, “a very substantial number of people support repealing the inheritance tax because they mistakenly believe that their own taxes will be lower as a result.” Political scientist John Sides finds that “correct information about who actually pays the estate tax does increase support for the estate tax.” He finds the effect is strongest among lower-income conservatives. Meanwhile, political scientists Anthony Fowler and Michele Margolis find that informing people about Republican and Democratic policies using objective information leads them to shift toward supporting Democrats. 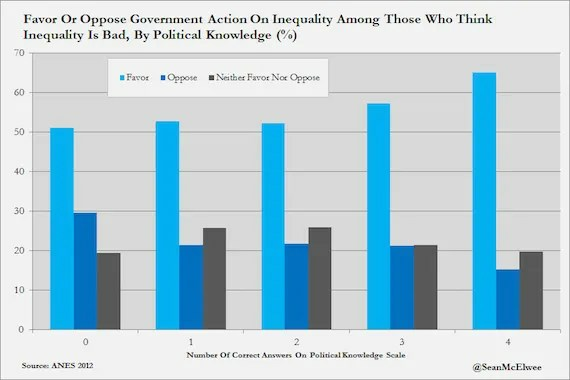 ANES data suggest that among those who agree that inequality is bad, higher political knowledge leads to more support for government action to reduce inequality. The chart below shows that among those who believe inequality is a problem, support for action increases with political knowledge (gauged by the number of correct answers to questions like who the treasury secretary is). These results should lead progressives to reconsider the importance of race as a motivating factor on attitudes related to a wide swath of policy issues. Indeed, consideration of race should be central to analysis of even issues, like economic inequality, that seem to not be about race. But further, they show that the idea that Republicans will ever go so far to the right that Americans will reject them is unlikely. The sad reality is that most Americans don’t see a large causal connection between government policy and their lived experiences. Instead, they’ll likely blame the poor, immigrants and blacks. This entry was posted in Uncategorized on March 4, 2016 by seanadrianmc@gmail.com. As the 2016 election cycle heats up, the key question at stake for most Americans is economic growth and jobs. The debate, then, will center around what to do with the fragile recovery that overwhelmingly benefits the rich; the stagnation of middle class incomes; and unemployment — which, particularly for young people of color, remains dispiritingly high. The right likes to argue that these conditions mark a clear failure of progressive policies, and in particular of the Obama administration. In the process, they reject policies that have, however imperfect, unequivocally strengthened the economy over the past seven years, such as the stimulus packages that came in response to the economic crisis. Meanwhile, while conservatives often claim that their policies are good for the middle class, systematic studies by economists, political scientists and sociologists suggest these claims are overblown. At the heart of the question is economic growth: Which party is better at delivering it? 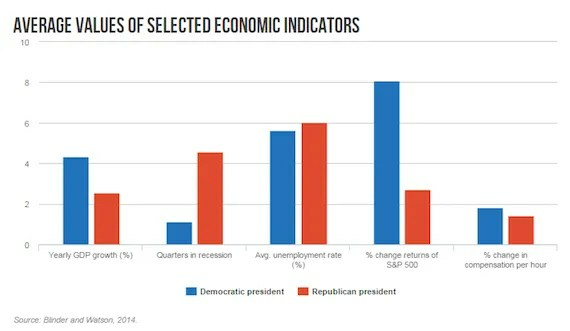 The chart below shows the gaps in various indicators between Republican and Democratic presidents. Democratic presidents average 4.35 percent GDP growth, compared with 2.54 percent under Republicans. Democrats also presided over a lower unemployment rate, higher stock market returns, higher corporate profits, higher compensation growth and higher productivity increases. These results remain even after various controls are applied. Though the authors want to chalk these results up to luck, I have outlined a few reasons to suspect other factors may be at work. The middle and working class have increasingly fallen behind as the richest Americans have seized a larger share of income and wealth. So while economic growth is certainly important, how it’s distributed is important as well. 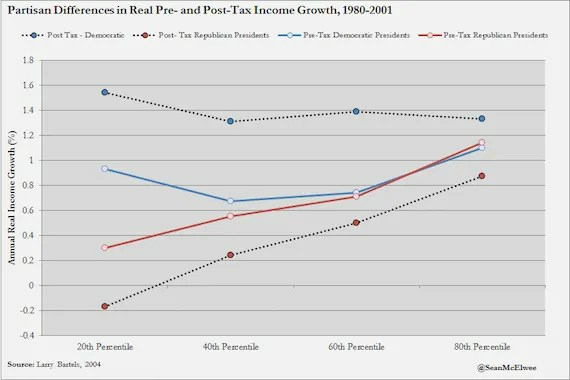 In a 2004 paper and a further analysis earlier this year, esteemed political scientist Larry Bartels has demonstrated that income growth is faster and more equal under Democratic presidents. He cites differences in policies like the minimum wage driving this gap. As he notes, the real value of the minimum wage increased 16 cents a year under Democrats, but decreased by 6 cents a year under Republicans. The chart below suggests this effect is driven by both market conditioning (see the gap in pre-tax income at the bottom) and redistribution (the post-tax gaps across the board). Bartels’ analysis is strengthened by a recent study from political scientists Elizabeth Rigby and Megan Hatch, who identify three major policies that states can pursue to slow growing inequality: higher taxes on the wealthy, lower taxes on the poor, and labor market policies that benefit workers (minimum wages, lack of right to work). They find that if states had adopted more liberal policies, the increase in inequality (as measured by the Gini Coefficient) would have been 60 percent smaller — and the share going to the top 1 percent would have been cut in half. At the state level, political scientists Anne Case and Timothy Besley find that Democrats boost spending and taxes, particularly in the areas of worker’s compensation and family assistance. Studies of the Medicaid expansion have overwhelmingly shown that Republican control of government is among the most important factors in predicting whether a state will expand Medicaid. Given the positive economic and social benefits of the Medicaid expansion, this illustrates how conservative ideology can hamper good governance. 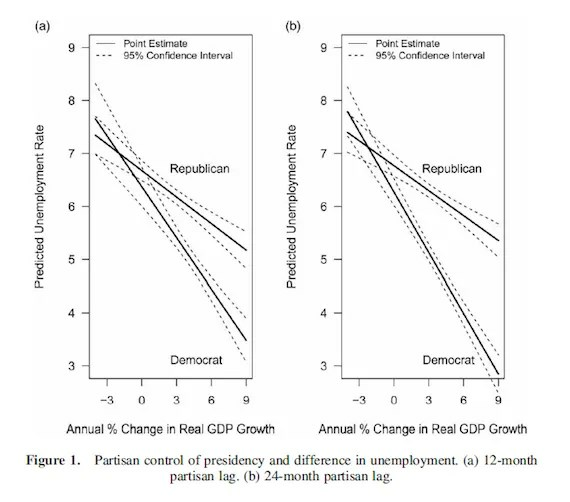 More recently, political scientists Christopher Witko and Nathan Kelly discovered that when economic growth is low, liberal and conservative governments perform similarly with regard to unemployment. However, when growth increases, Democrats do a better job turning that growth into lower unemployment. Further, in another study, they find that state-level outcomes have played an increasingly important role in shifting the income distribution, meaning that these effects are even more meaningful. 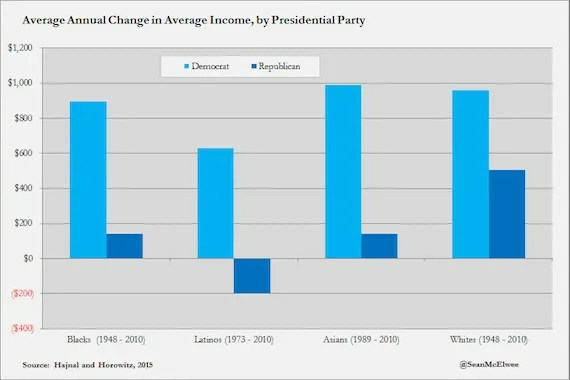 Further, they find deep gaps in income growth between Democrats and Republicans, with all racial groups seeing far faster gains under Democrats than Republicans, though Republicans still ensure whites gain the most (see chart). This dynamic was noted by Bartels in “Unequal Democracy,” where he found that economic growth was slower during Republican presidencies, but the gap closed in the last year before elections. Ironically, then, Democrats gain very little in terms of electoral victories because of their superior economic management. In addition, as I’ve noted, factors like low turnout, the rise of the donor class and globalizationmake it harder for progressives to shift the income distribution. Two newstudies of finance show that Democrats have shifted to the right on financial deregulation, dramatically increasing inequality. (One of the studies linkscampaign contributions to Dodd-Frank roll call votes.) A study by political scientists Alexander Hertel-Fernandez and Theda Skocpol finds that the rise and mobilization of the small-business lobby has divided Democrats on tax issues. Further, a study by a group of political scientists notes that the strong status quo bias, exacerbated by conservative obstructionist politics, makes it increasingly difficult to implement inequality-reducing policies. The results of a broad range of studies are clear, then: Progressive policies are better for economic growth, better at creating a racially equitable society, better at strengthening the middle class and better at reducing unemployment. However, progressives must still grapple with the constraints imposed by globalized markets, the declining strength of organized labor, the rise of the donor class and low voter turnout. But the arguments that conservative policies are beneficial to the working class, or that there isn’t a dime’s worth of difference between the two parties, are difficult to square with the research. This entry was posted in Uncategorized on March 3, 2016 by seanadrianmc@gmail.com.